Two Tribes games, developer and publisher behind a few of my Switch, and Wii U, favorites Toki Tori and Toki Tori 2+, as well as RIVE, have released Swap This! on the Switch. Originally a very-short lived mobile game that was released and then pulled from App Stores shortly thereafter have revisited and relaunched Swap This! on the Nintendo Switch this November. There’s not much of a story in the match, chaining master game of Swap This! You shouldn’t be surprised though as not many puzzle matching games have a story. 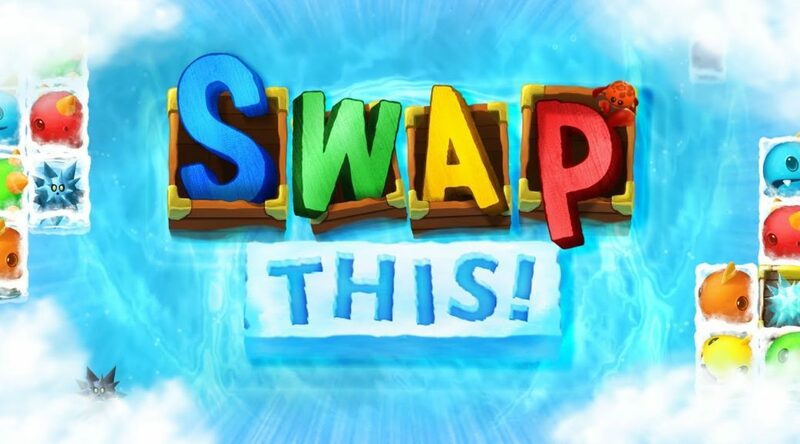 The gameplay of Swap This! can be boiled down to the tried and true frenetic gameplay of swap tiles, or in this case, fish, to match the colors of others in their ‘schools’ if you will. Linking together four or more fishes of matching color will result in their group disappearing act dropping other fish and hopefully, if you have lined things up, create a chain reaction. Swap This! reminds me a lot of the character and style of the DS game, Zoo Keeper (which may have found itself on other platforms as well) in that you manage the color fish similarly to the varied animals of the Zoo. Swap This! does change things up a bit by introducing various game modes. These include Minute Match, Wave Mode, Fish Fight and Puzzle. Minute Match challenges gamers to get high scores and larger combos within a 2-minute time limit. Wave Mode is basically an endless mode until you run out of time within each successive waves. The score you need to reach keeps edging higher and higher and will require not only quickness but also better chaining within each level. Fish Fight is a sort of boss battle which basically has you completing chains in your level which drop fish on a boss enemy. The larger your chain the more the fish will fall to the bottom of the ocean floor. Puzzle mode requires that you beat a level under a maximum set of moves. Having an allocated amount of moves means you need spacial awareness as well as understanding how chains work to complete the level within the required moveset. These modes are all standard affairs with games in this genre. There are a variety of power-ups that can be found in the game. Some freeze urchin tiles and allow you to swap them with fish when they are otherwise stationary and intrusive. There are also row and column clearing tiles which when used strategically can change the tide of the game and get you the high score you are looking for. The games sounds and audio are the kind you turn down and tune out. There’s nothing really special here and mostly just forgettable at the end of the day. These types of puzzle games though usually don’t try to go out of their way to include memorable tunes so it’s not really a surpise. Swap This! is a simple game and that is ok. I never encountered any bugs and the game ran fine in handheld mode, which is how I preferred to play just because the touch-screen controls are a lot easier than controller options. One thing to note is the game is limited to Joy-Con only as a controller method. The game however is far superior with touch-screen controls. My only other qualms with the game are trying to figure the target market for it on the Switch. I don’t really see a lot of people playing the Switch finding this game or being interested in it. But maybe Two Tribes was able to create this game quickly as a test bed for future budget-priced games on the system. Swap This! by Two Tribes fills a gaming void of budget games you’d find in the Android and iOS app stores for 99¢ – $2. If you go into things with lowered expectations based on a sweet price point and the idea that this game is meant to be a time waster you should be ok to spend the dollar and change on this one. That being said the game is still at its core simple, repetitive, and mediocre. Match-Four games are everywhere and they are usually free on mobile devices. While the genre and price point is mostly empty on the Switch, the game does nothing special to elevate itself or set itself up as anything special. Your value and mileage on games like this will vary.